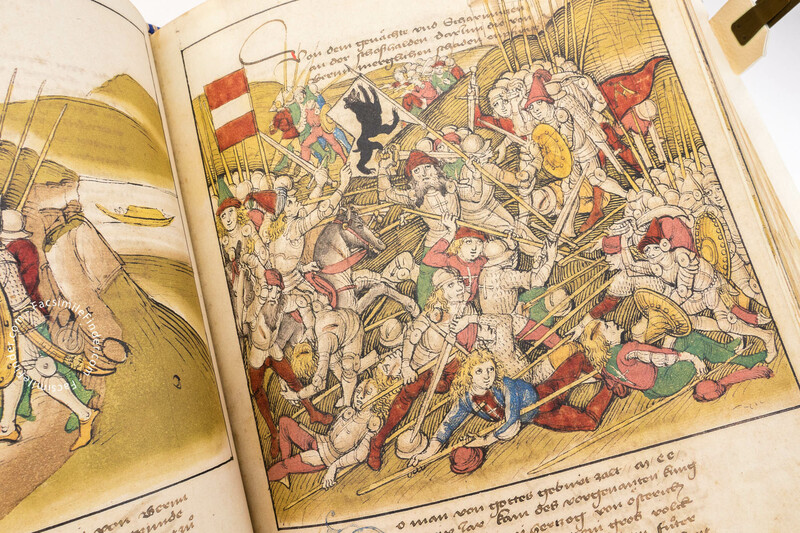 Three magnificent illuminated chronicles of Diebold Schilling’s own hand have come down to us: the Great Burgundian Chronicle, also called the Zürcher Schilling describing the history of the war between the Confederation and Charles the Bold, the Official Bern Chronicle in three volumes, and the so-called Spiez Chronicle, commissioned by Rudolf von Erlach, mayor of Bern, which became the crowning achievement of Schilling’s oeuvre. 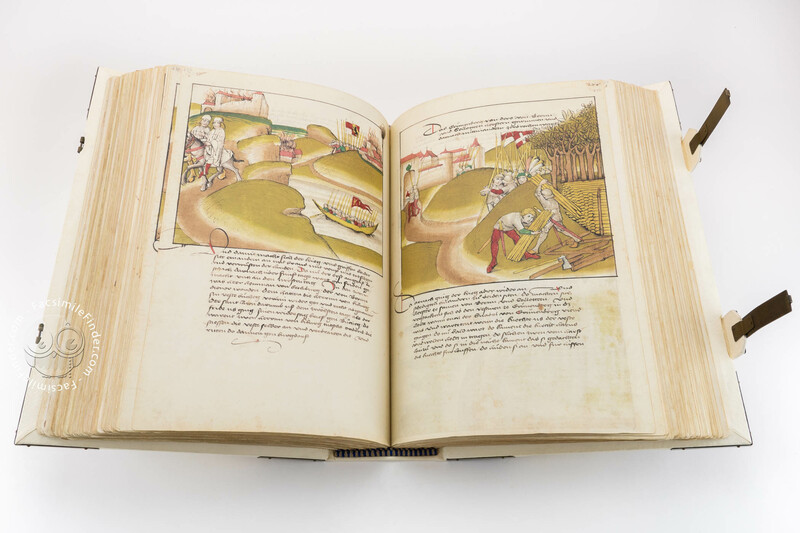 This chronicle is the last work executed in the magnificent tradition of Bern chronicles of the 15th century. Diebold Schilling’s relationship with Rudolf Erlach’s family was particularly good. Schilling’s wife Katharina even was godmother of one of Rudolf’s sons. 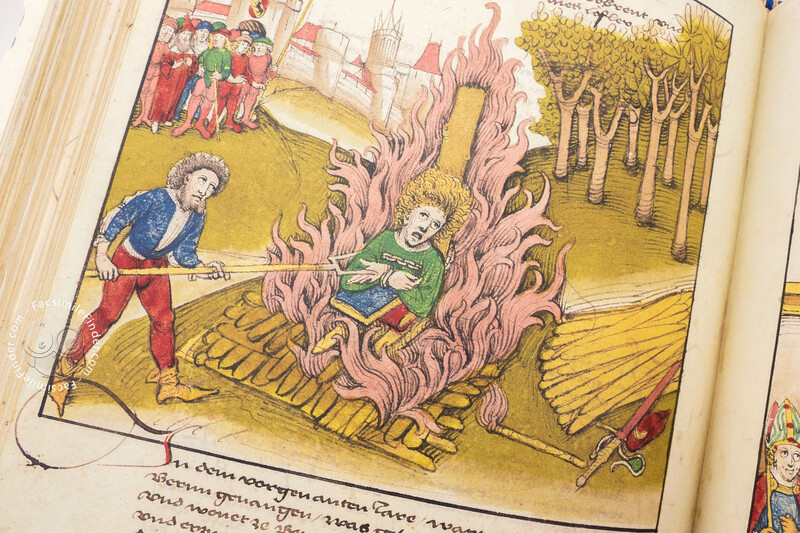 Rudolf was very keen to possess his own copy of Schilling’s chronicle. 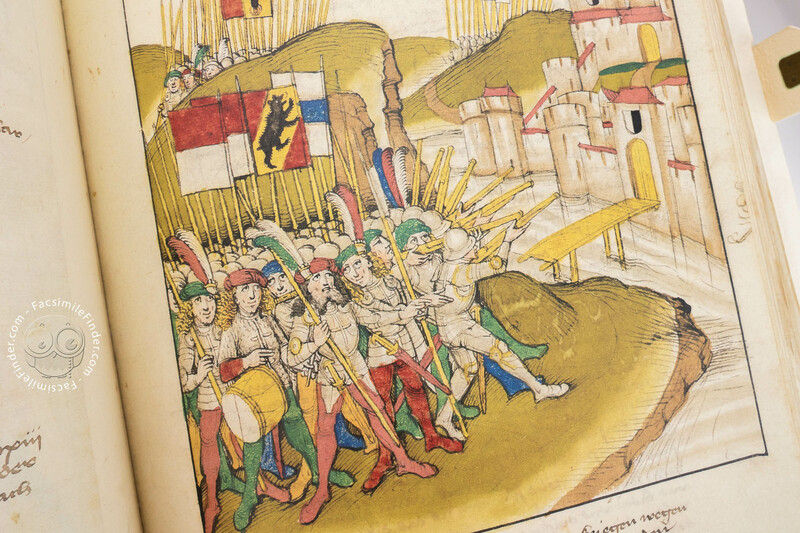 This version, the Spiez Chronicle, would become Schilling’s last work, he died in 1486. However, its truly outstanding illustrations make this chronicle the most precious work of Schilling’s entire oeuvre as an artist. 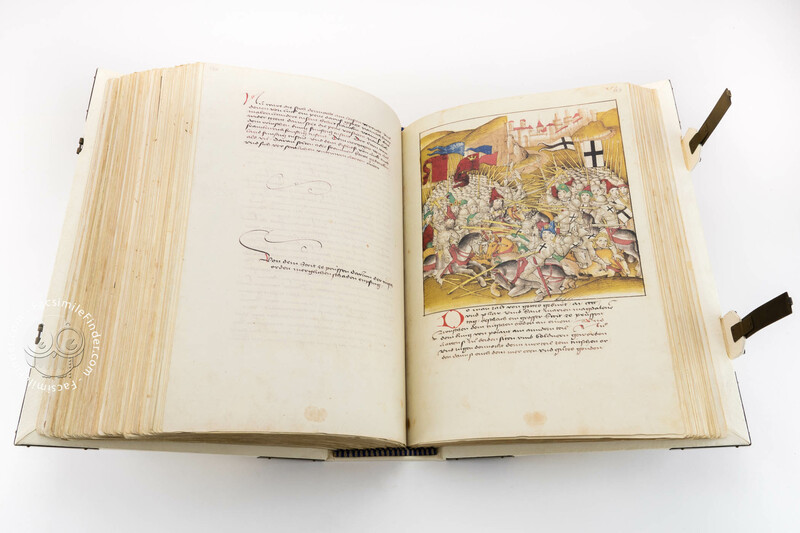 Rudolf von Erlach was at the height of his political career, when he commissioned his private chronicle of Bern from Diebold Schilling. He belonged to the leading members of the Council of Bern. 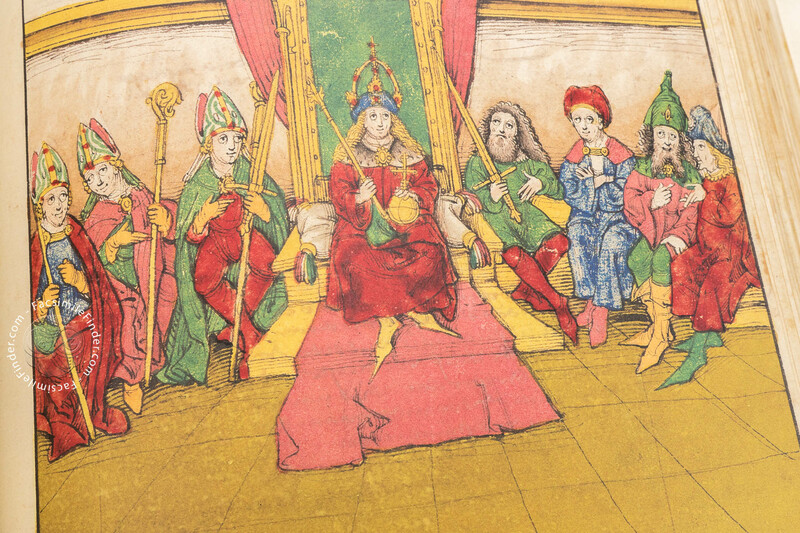 His family could boast a glorious past as a dynasty of high-ranking officials under the Counts of Nidau. 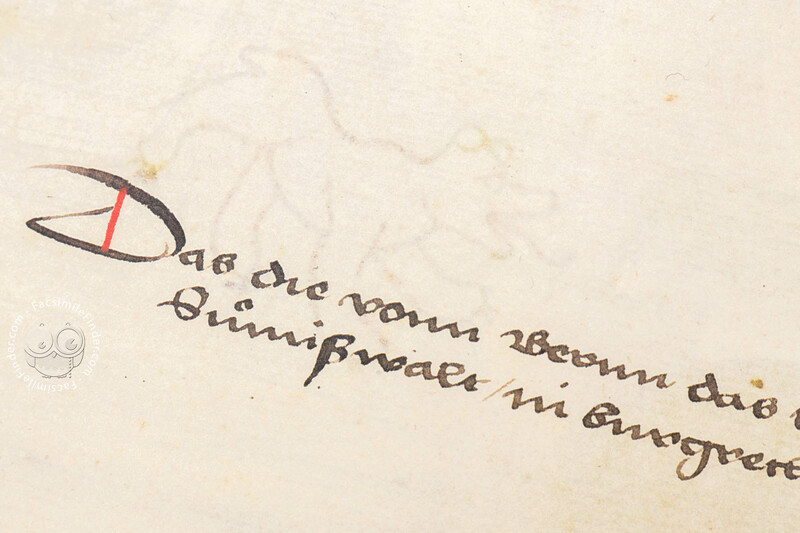 Rudolf was born in 1448. 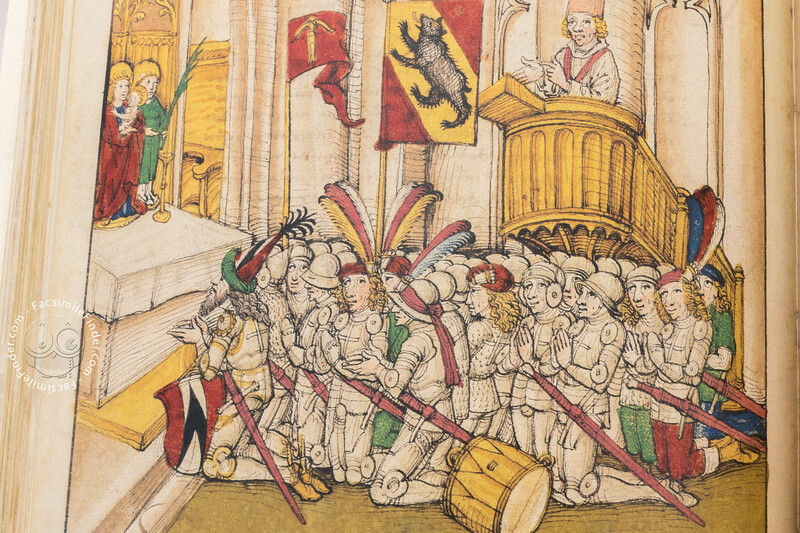 In the conflict between Bern and Burgundy he took sides with his father’s home town, although he held a number of feudal estates in Burgundy. Immediately, his political career began, and it ended at the top of the city’s administration. The historical work commissioned by him combined the proudness of his family’s glorious past with the self-confidence of a Bern statesman, and at the same time expressed Rudolf von Erlach’s way of life and thinking. When Diebold Schilling at Christmas 1483 presented his Official Chronicle of Bern in three volumes to the Bern Council, he may have provoked Rudolf von Erlach’s wish to call such a beautiful work his own. He ordered the chronicle just a little later. 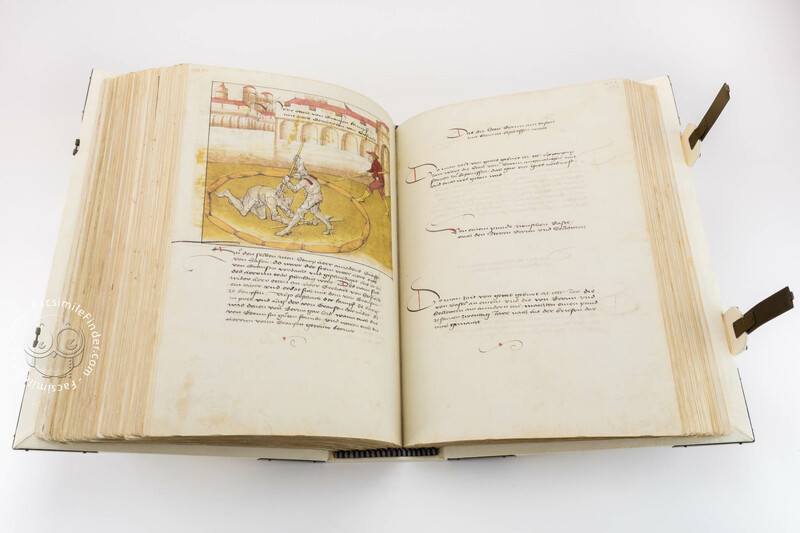 The text of the chronicle is written in Schilling’s precise hand writing which he had used in previous editions. 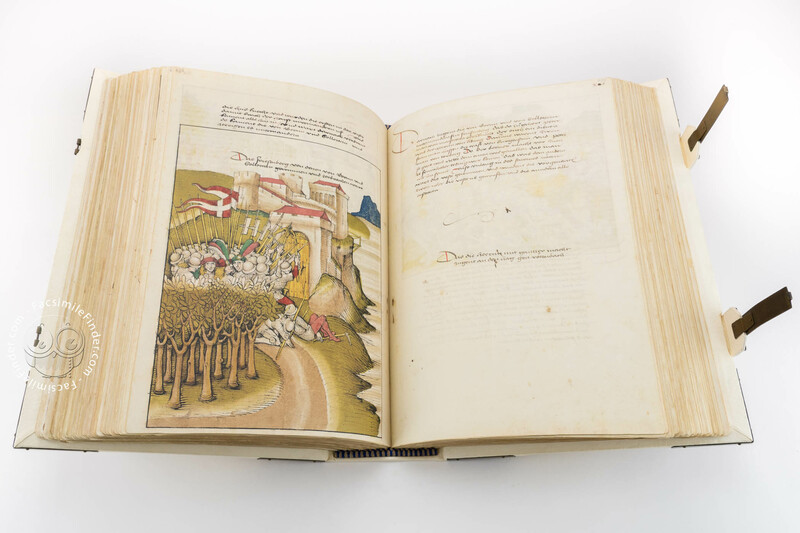 In 344 illustrations on 808 pages he deals with the history of the City of Bern, from its beginnings to the year 1465. Several smaller abbreviations toward the end of the chronicle betray the writer’s impatience: due to his advanced age and illness, the annalist had to finish his work in due time. 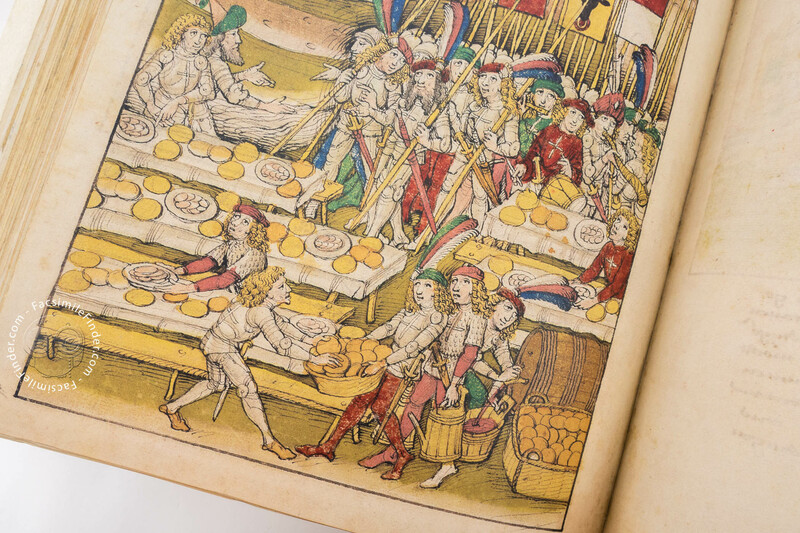 The most unique pictorial decoration make Schilling’s last illuminated chronicle the crowning of his comprehensive oeuvre as an annalist. 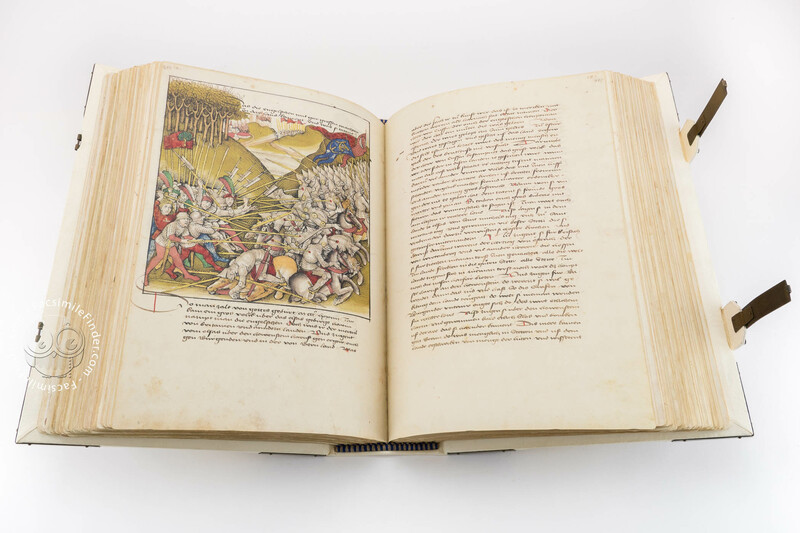 Its life-like pen drawings coloured with many shades of azure have clearly surpassed the compositions of early illuminated chronicles. 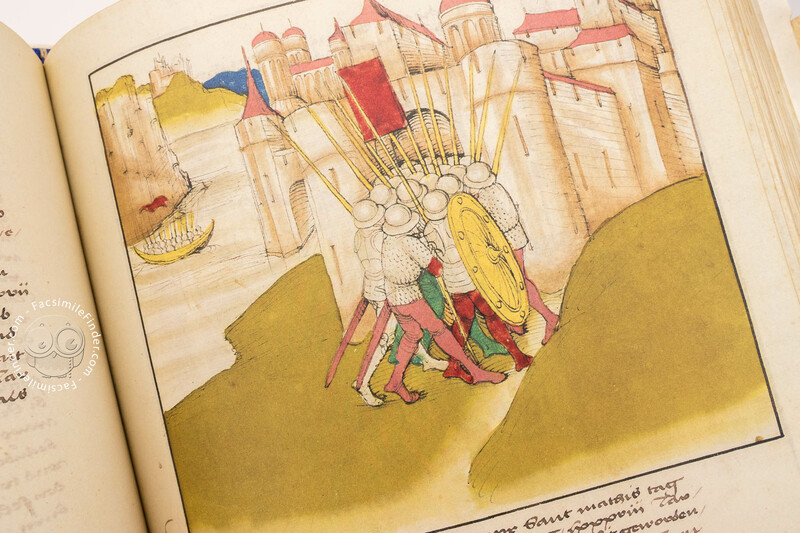 A particular feature of these illustrations is the strong formal ability of the artist to direct and combine the main and secondary levels of the action, to create a link between background and foreground scenes. Frequently he allows a charming insight appear in distant landscapes, as if through a window in the background, thus adding a lyrical counterpart to the dramatic events taking place in the foreground. 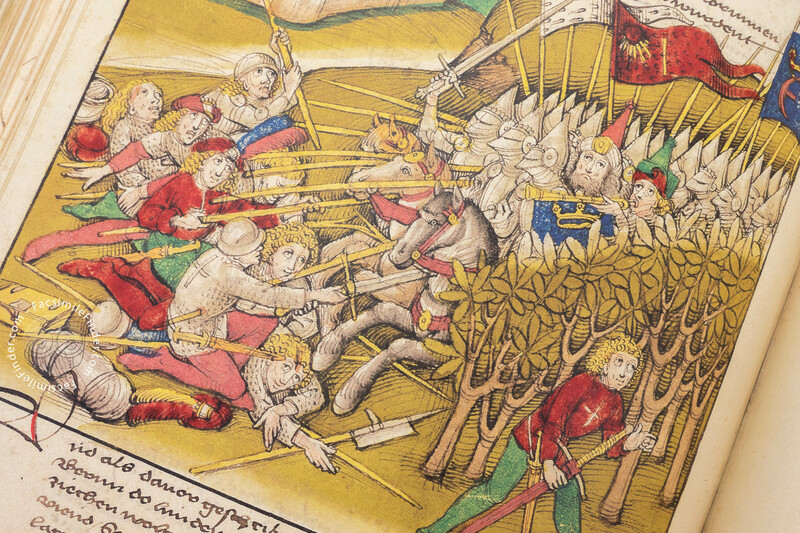 In the same way as in the text, the illustrations of the chronicle are also dominated by descriptions of war scenes. 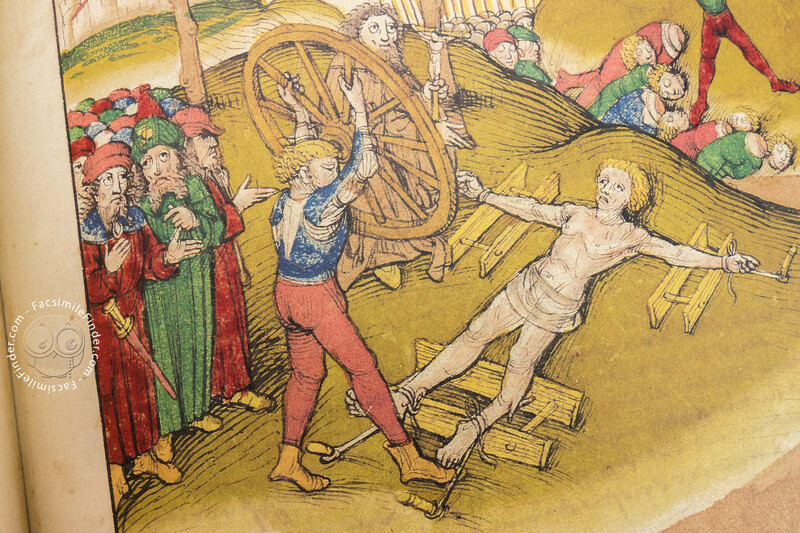 In the centre, the artist places his protagonists who often appear as two opposed groups of persons. Proportion and pose of the figures show the remarkable ability of the artist to reproduce human physiology to the finest detail. 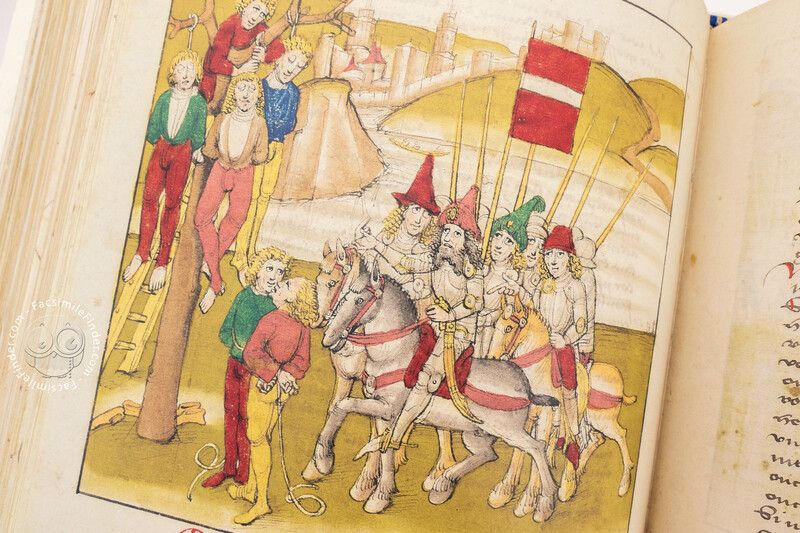 The decoration of the book was specially designed to meet Rudolf von Erlach’s personal needs. It was supposed to display the glory and honour of his family for posterity. 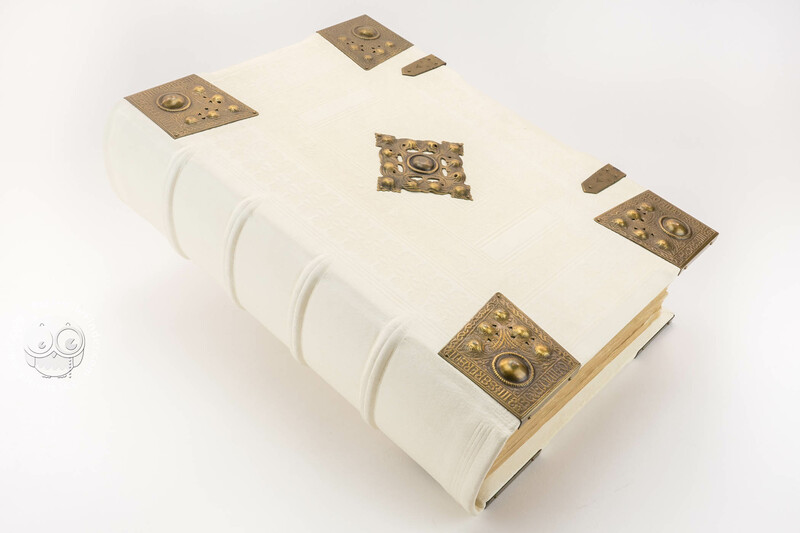 Manuscript book on parchment − 39 × 28 cm − 808 pp. 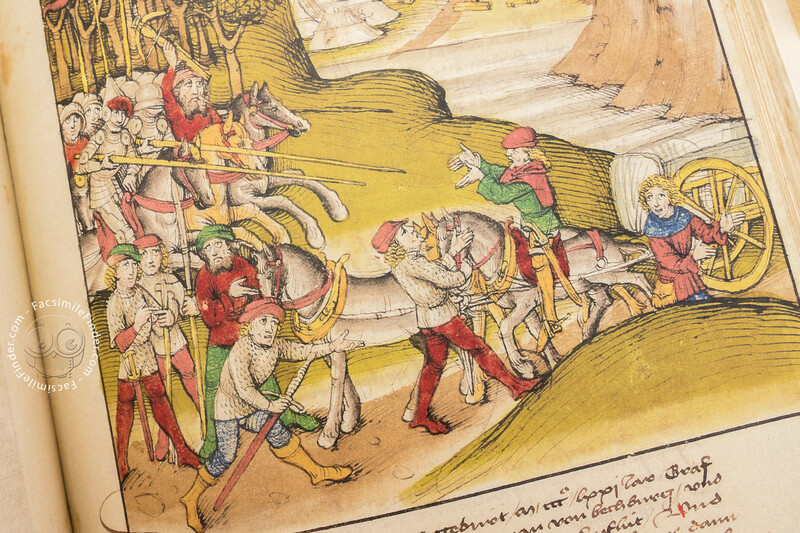 Full-size color reproduction of the entire original document, Diebold Schilling’s Spiez Illuminated Chronicle: the facsimile attempts to replicate the look-and-feel and physical features of the original document; pages are trimmed according to the original format; the binding might not be consistent with the current document binding. 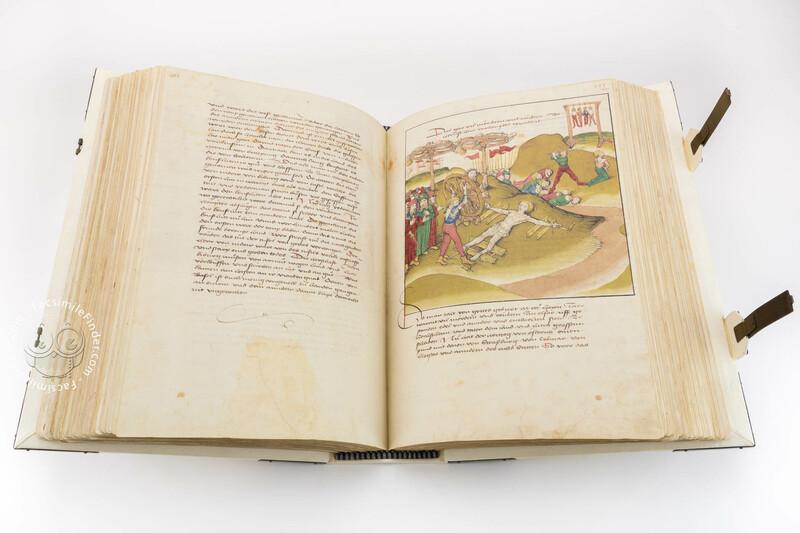 The commentary volume of 600 pages includes a complete edition of the text and reveals the outcomes of scientific research begun on the occasion of the reproduction of the manuscript. The leather binding with blind tooling, corner and centre fittings and two metal clasps has been made by hand. The headband is faithful to the original and has been stitched by hand and modelled after antique craftsmanship. The double leaves were hand-sewn on five cords.